Leaders in low- and middle-income countries (LMICs) require timely and compelling evidence about how to strengthen their health systems to improve the health and well-being of their citizens. Yet, evidence on how to strengthen health system performance to achieve sustainable health improvements at scale, particularly toward Ending Preventable Child and Maternal Deaths (EPCMD), fostering an AIDS-Free Generation (AFG), and Protecting Communities against Infectious Diseases (PCID) is limited. The evidence that does exist is scattered, insufficiently analyzed, and not widely disseminated. Without evidence, decision-makers lack a sound basis for investing scarce health funds in health systems strengthening (HSS) in an environment of competing investment options. 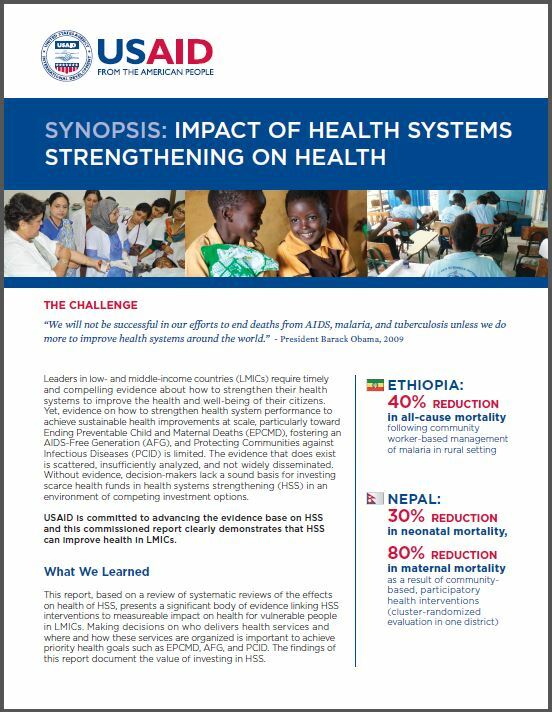 USAID is committed to advancing the evidence base on HSS and this commissioned report clearly demonstrates that HSS can improve health in LMICs. 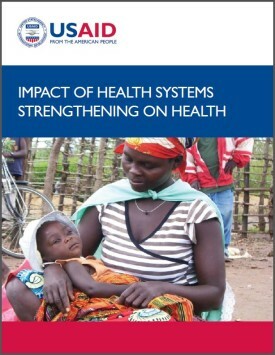 This report, based on a review of systematic reviews of the effects on health of HSS, presents a significant body of evidence linking HSS interventions to measureable impact on health for vulnerable people in LMICs. Making decisions on who delivers health services and where and how these services are organized is important to achieve priority health goals such as EPCMD, AFG, and PCID. The findings of this report document the value of investing in HSS.